Art books are expected to be sumptuous, large, and expensive. Encyclopedias generally bring to mind multi-volume fact forests-and the school projects that feed on them-that make students cringe. Handmade in India is both of these, and neither. With a page count of less than 600 and a price under eighty dollars, Handmade in India combines the best of the art book and the encyclopedia without the negative aspects of either. This book was first published in 2007 under the auspices of the Council of Handicraft Development Corporations, and funded by In-dia’s Ministry of Textiles. In a strictly commercial light, one might view this book as a massive public-relations campaign in reference book form. But it is much more than a PR campaign. 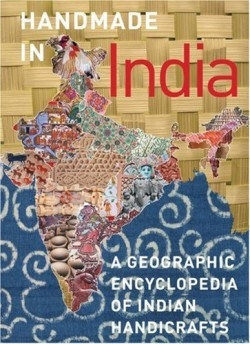 Handmade in India truly is an encyclopedia, structured on India’s geography, which argua-bly provides every item of interest related to each type of handcrafting activity used in the villages and cities of that country. One could say that anything anyone ever wanted to know about Indian handicrafts could be found in this book, and that claim would be tough to dispute. Separating the country into zones for ease of reference, the editors provide color photographs that accompany each en-try. The material is meticulously presented, and the usage guide included in the book helps the reader navigate through the wealth of in-formation presented. Handmade in India also includes maps, indices, a glossary, two bibliographies, and other factual matter that supports its content. The copyright page even includes a map “disclaimer,” since the borders of some provinces in India are still in dispute. One would be hard-pressed to find a more academically objective viewpoint than the one taken in this book. Aditi Ranjan and M. P. Ranjan are both teachers, designers, and cultural preservationists who have worked with the National Institute of Design (India) since the 1970s. This book is a fitting testament to their years of teaching and research. Its structure, content, design, and quality could only have come from authors with a heartfelt love of handcrafts and home. Readers can open this book to almost any page and find something riveting. Bhubaneshwar is the provincial capital of Orissa, and of the six handcrafts listed for this geographical area, palm leaf engraving is chosen as one of the three featured here (the others are stone work and papier-mache). The editors don’t rely on just photographs of completed works, but they extend the entry to inform readers about the tools, general technique, and subject matter used in this delicate handcraft tradition. If a reader is looking for something specific, say jewelry, the Index of Subjects is the place to start. There are eleven entries for jewelry, including brass badge casting in Malerkotla (Patiala), and Rajasthan’s silver jewelry. Another entry details how a Kota woman of the Nilgiris district wears silver jewelry and that made of other metals, such as copper. Handmade in India has a built-in audience of artists, students, and appreciators of Indian handicrafts, but it doesn’t stop there. This is a reference book that belongs in libraries both public and collegiate; fiction writers could benefit from it as well, whether they chose to write about India or not. Perhaps the only negative aspects of this book are the sheer volume of information it contains, and the nature of ency-clopedic presentation. However, Ranjan and Ranjan have done their best to avoid making their subject too unmanageable. For anyone who appreciates creativity and the amazing versatility of human crafting, this book is an excellent starting point. The 3,500 photographs are clear, sharp, and composed for maximum impact. They also include a wide range of design choices, with a judicious but welcome use of insets and cutouts (which lack background, enabling the photograph’s subject to stand out).